This is a large petition. To intercede for a whole city needs a stretch of faith, and there are times when praying for one man is more than we can handle. But how far-reaching was the psalmist's dying intercession! How comprehensive! How sublime! “May the whole earth be filled with his glory.” Not a single country is exempt even if it is crushed by the foot of superstition; this does not exclude a single nation however uncivilized. For the terrorist as well as for the civilized, for all places and races this prayer is uttered: It encompasses the whole circle of the world and omits no one. We must be up and doing for our Master, or we cannot honestly offer such a prayer. The petition is not asked with a sincere heart unless we endeavor, with God's help, to extend the kingdom of our Master. Can you bow before the Crucified in humble adoration and not wish to see your Monarch Master of the world? You only pretend to love your Prince if you do not desire to see Him the universal ruler. Your piety is worthless unless it leads you to wish that the same mercy that has been shown to you may bless the whole world. Lord, it is harvesttime; put in Your sickle and reap. The most frequently requested messages by Alistair Begg from 2010-2015 have been consolidated in this inspiring collection of Bible teaching that covers a wide variety of texts and topics. In this rich compilation of over 40 hours of Scripture-based instruction, Alistair Begg unpacks what the Bible says about many of today’s most pressing life issues. How to find peace in times of fear and anxiety, gaining comfort in the face of death and dying, understanding the marks of genuine friendship, and discovering how to teach our children what is right and true are just a few of the diverse topics thoroughly explored in this conveniently packaged study. 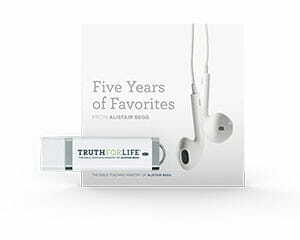 Five Years of Favorites contains 62 audio messages from Alistair Begg on a single flash drive. All of the messages can be easily downloaded to a computer. Originally published August 06, 2016.